The item in question (which had found its way into the weekly veggie box I get from a local farm) turned out to be moringa. 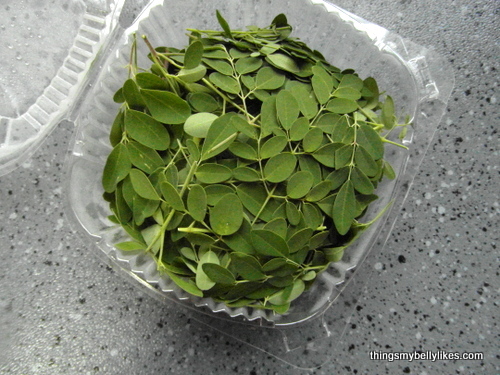 Moringa is a leafy green plant with some serious nutritional street cred. It’s commonly eaten in Asia, Africa and the Caribbean…which explains why this Irish gal was so ignorant of its existence. My farmer knows his stuff though. Moringa is one of those veggies that actually deserves the term ‘superfood’. It contains four times the calcium of milk, seven times more potassium than bananas and 25 times more iron than spinach. The plant is also rich in vitamin C, B2 and magnesium. So how was I to get all this goodness inside my body? Apparently you can steam moringa as you would spinach and the flavour is quite similar. I’ll probably do that with the leftovers but for now I’m making tea. The addition of ginger takes the edge off the bitter, spinach-y taste but you can also add a dash of honey if you like your teas sweet. 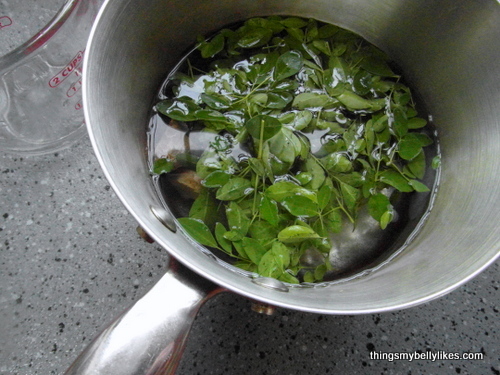 Pour the water into a saucepan and add the moringa and ginger. Bring to a boil then turn off the heat and let sit for 7-10 minutes. Interesting! 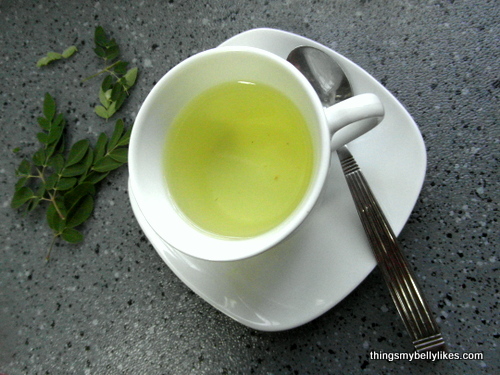 We use Moringa leaves in almost all of our recipes. You can add it either to simmering lentils or use it at the end as seasoning to the curries. Never tried out the tea though.